Do you have a recipe in your arsenal that has slowly evolved every time you’ve made it and become something quite different from the dish that you started out with? This bottle gourd (lauki) and mung bean (lentil) recipe holds the record for the most evolved recipe in my repertoire. The recipe that I have shared with you is finally at the stage where we love it and perhaps we’ll keep it in its current avatar. 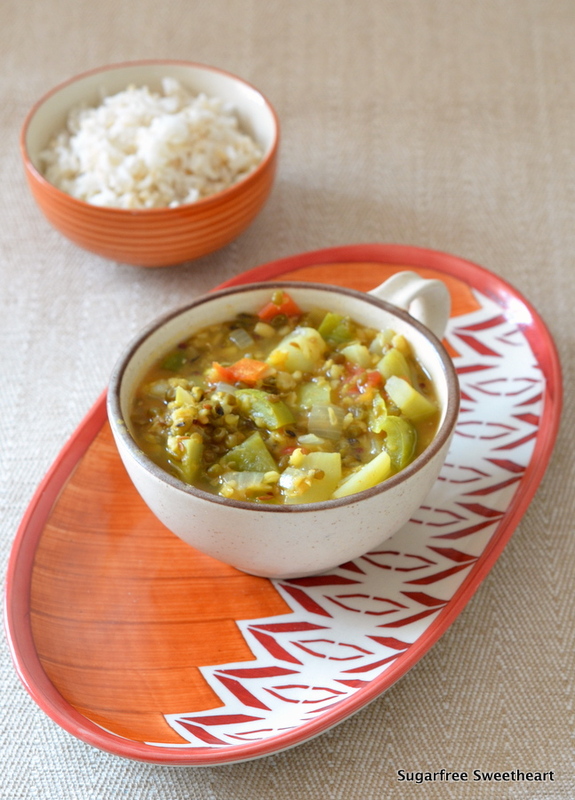 This soupy dish started out as my husband’s recipe for a vegetarian version of dalcha made with bottle gourd and channa dal and spiced with cinnamon and cardamom. Over time I have experimented with different dals and ended up with split mung bean as the best option. I also added capsicum to the mix for an extra dimension to the flavour. The cinnamon and cardamom pop in and out of the recipe depending on my mood. Sometimes, I divide the dish into two and add the extra spices to one part only so that when we have the dish at the second meal, it will taste different! You can have this dish with brown rice or even as a standalone, filling soup. This recipe is suitable for diabetics, weight watchers, and soup savourers. Use tamarind paste instead of lemon and omit the cinnamon and cardamom to get a more ‘sambar’ kind of soup. Add lemon directly to your plate if you intend to re-heat the remaining soup because heating a dish with lemon may cause it to go bad. Add a smidgen of red chilli powder or cayenne pepper for an extra spicy kick. Use split moong dal without the skins for a lighter coloured soup and a little less fibre! And you’ve given me the idea to try the combination in sabzi form! Thanks Aruna! Thank you, Elle. Yup, I draw, scan, and edit in photoshop. I’m hoping that as time goes by, I get better at the process and so can finish it in a shorter amount of time! What a delicious and hearty looking bowl of soup! I wish I had a bowl of it right now, as I’m feeling a little chilled. (Tired of the snow now). 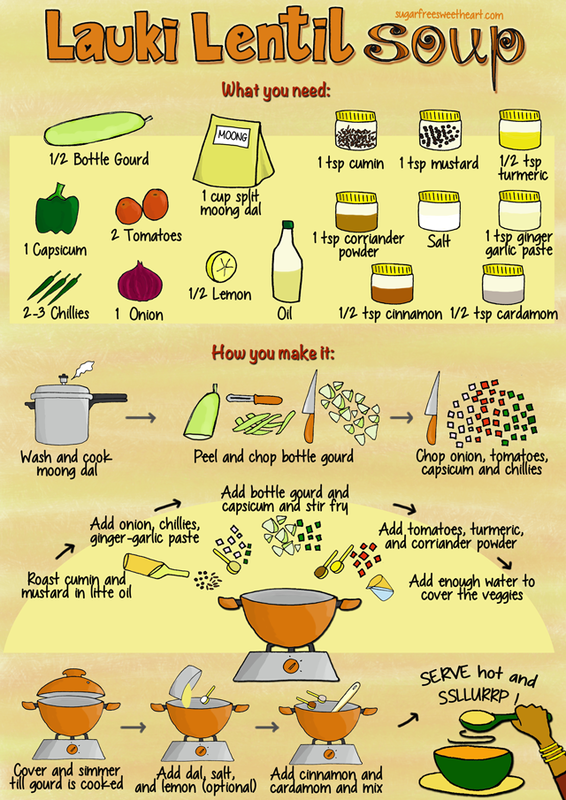 I love your illustration of the recipe! I loved this evolved version :). Definitely a lighter take. Yessss :))). How are you doing with your writing? Writing is in the most difficult stages now, Sonal – sketching out the plot framework. I’d say I’m halfway done. So I have to do the rest and then actually start writing the novel itself! Ummmm, I’ll have to try that during out winter here. Thanks. Yup, it’s warming enough for winter fare! I’m a bit like that with pasta bakes!! They get more and more evolved each time. This soup looks fantastic!